2 CONFIGURATION: Complete configuration of hardware to ensure measurements ranged and grouped correctly. Install of Data viewing software on relevant local PC’s for operators to view EMS data in detail if and when necessary. Irish Power and Process (IPP) is a leading supplier of validated Environmental Monitoring Systems (EMS), an independent back up to site Building Management Systems (BMS) systems in the Pharmaceutical, Medical Device and Laboratory industries. BMS Systems play a vital role in the running of a manufacturing process where the monitoring and control of atmospheric changes is crucial to consistency of production, sterility of end product and comfort of operators in the working environment. The validation of a BMS system is both a costly and timely exercise which many companies would rather avoid. The solution is the installation of an independent system that is easily validated and provides auditable records with full traceability of operation critical variables. Why use an accredited calibration laboratory? The ISO17025 standard is used for evaluating laboratories, and this standard has the criteria’s relevant to a laboratory to perform precise and accurate test and calibrations • Technical competency of the personnel • Validity and appropriateness of the procedures and methods • Traceability of calibrations to national standards • Appropriate application of measurement uncertainty • Suitability, calibration and maintenance of reference equipment and the laboratory • QA of inspection and calibration data • Continued compliance are ensured by audit from the national authorities • Suitability, calibration and maintenance of reference equipment, laboratory environment, Quality assurance of calibration data. 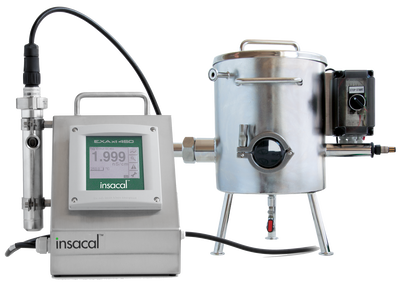 Inductive conductivity analysers In the manufacturing process of Pharmaceutical, Chemical and Food & Beverage industries, the cleaning and sterilization of tanks and piping are done with various cleaning solutions, fresh or hot water and steam after manufacturing products. 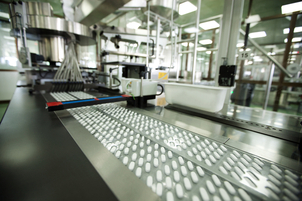 Clean-In-Place (CIP) is the system designed for automatic cleaning and disinfecting. The recovery of cleaning solutions contributes significantly to reduce chemical costs and wastewater processing costs. 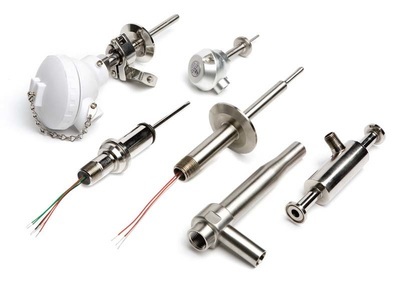 Yokogawa FLXA21 inductive conductivity transmitter has earned a reputation in the recovery of cleaning solutions because it can take measurements with good boundary surface precision over a wide range. 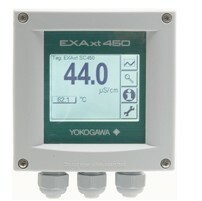 2-wire pH transmitters like the Yokogawa Flexa cannot power relays, which would be used to start the wash system, due to the requirements of hazardous areas, as such supporting a wash system is not possible. Using the UT35A Controller product with in built ladder functionality allows a wash system to be created outside the pH transmitter, along with the added benefit of providing pH control as well. The UT35A can be mounted in a safe area and using barriers the wash system can be operated. The ladder function within the UT35A controller allows the interval timer, wash cycle timer and recovery timer to be utilized and for the 4-20mA pH signal to be held during the wash and recovery periods. 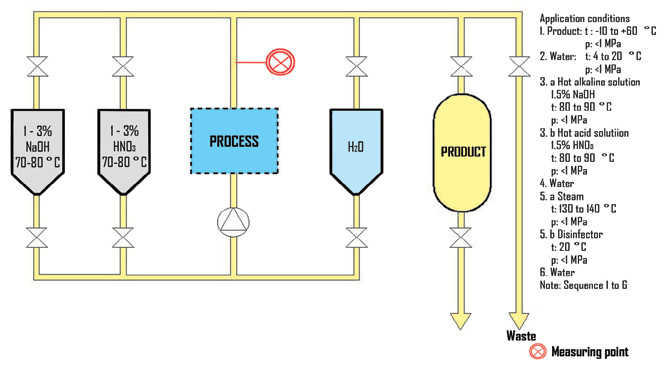 By holding the value during the wash cycle and the recovery period, interruption to the process is avoided. ​pH wash systems are a requirement for many industries where electrode fouling is common place. Large amounts of deposits form over a period of time preventing the sensors performing correctly. This results in measurement loss and repeated expensive electrode replacement. 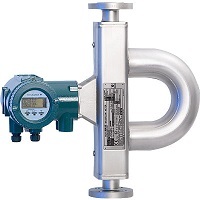 It is difficult to apply wash systems to 2 wire transmitters due to hazardous area restrictions therefore incorporating the wash function within a control device outside the hazardous area provides a cost effective solution. 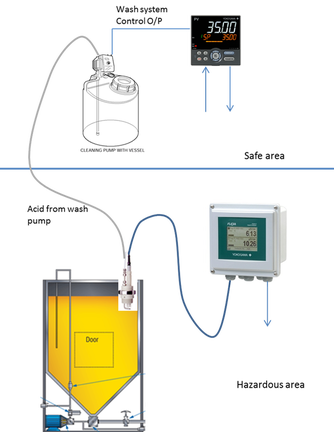 Application Outline A perennial issue encountered in process pH measurements is the coating of the electrode surface by a component of the process fluid. 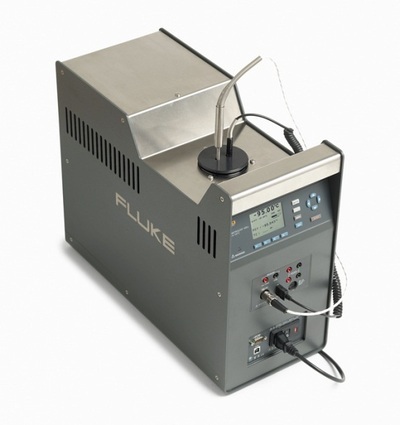 In order to function correctly a pH electrode needs to make a good contact to the liquid it is measuring. Any deposit forming on the electrode forms a barrier between the electrode sensing surface and the fluid being measured, depending on the type and degree of deposit it will at least slow the response and, in time, prevent the electrode functioning at all.